The auction will help raise funds for children and adults with disabilities. Earrings donated by Cary jeweler. Challenge that will be held Saturday, June 4, from 6:30-10 p.m. at the Hinnant Family Vineyards in Pine Level, NC, to benefit children and adults with disabilities. 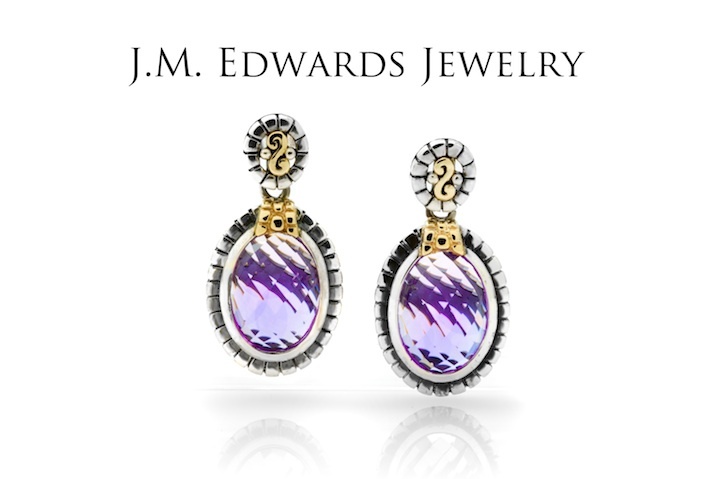 Among the items auctioned this year will be the pair of sterling silver, 14-karat yellow gold, and Amethyst drop earrings donated by J. M. Edwards Jewelry to show the company’s support for the fundraiser. Hosted by RHA Howell, Inc, and benefactors US Foodservice, Hinnant Family Vineyards, and Southern Pharmacy Services, proceeds from the Epicurious Vino Challenge tickets sales and auction will directly benefit children and adults with disabilities across North Carolina. Valentine anticipates this year’s event selling out quickly. To reserve single tickets ($50 each) or to reserve a table for 10 ($400), go to http://www.rhahowell.org/NewsEvents/Epicurious/tabid/737/Default.aspx. Payment by PayPal is available. Questions about tickets and sponsorships may be directed to dvalentine@rhanet.org or by calling 919-803-2960. Other sponsor for this year’s event include Southern Pharmacy, Van Products, L&M, Fallon Benefit Group, Marcom Medical Consultants, and Wake Stone Corporation. Print Enterprise, Inc., is providing all printed materials. For more information on the event, including the list of participating chefs, visit www.rhahowell.org and click on “EVC 2011,” and visit the event’s Facebook page. RHA Howell is a not-for-profit 501 (c) (3) organization that has been helping people with disabilities and special needs, and their families, make choices to live more independently for more than 35 years. Integrity, high standards for quality, and hard work are at the core of every RHA Howell disability assistance program. Proven leaders in caring for people, RHA Howell, Inc. is a pioneering force in the field of human services, particularly supporting infants and children. For more information, please go to www.rhahowell.org.